Janie Marie Strother Wilson, daughter of Loyd Bradford Strother and Mary Agnes Bush and married to Luther J. 'Mims' Wilson. Lawn Independent School District Teacher (1947-1948). Memorial services for Janie Marie Wilson, 89, of Cleburne, Texas, will be conducted at 2 p.m. Wednesday, Jan. 27, 2016 in the Rosser Funeral Home Chapel. Visitation for family and friends will be held from 6 – 8 p.m. Tuesday, Jan. 26, 2016 at Rosser Funeral Home. Janie Marie (Strother) Wilson was born on July 12, 1926 in Abilene, Texas. The only child of Roy and Mary Strother, she loved growing up with her cousins on her father's family farm and attending school. Janie worked hard and became the valedictorian of her class at Ovalo High School. She attended Abilene Christian University and graduated with a teaching degree from Texas Tech University. 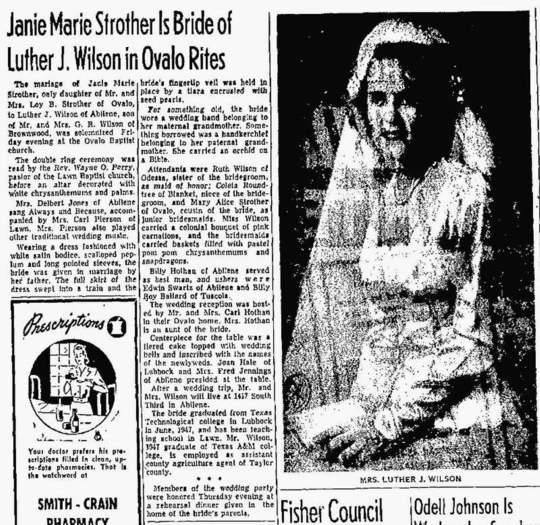 Janie married L J (Luther) Wilson on Dec 5, 1947. In 1950, they welcomed their first child, Janis, while residing in Roby, TX. After making the move to Cleburne in the early 50's, Janie taught school for the Joshua and Cleburne school districts. In 1961, they had their second child, Jay. Throughout her life, Janie worked hard and was an eager volunteer. She and Luther headed the Cleburne Little Dribblers' Program for many years. Janie was a member of King's Daughters, Watch and Work Circle and the Heritage Assembly. She was a Sunday school teacher at Field Street Baptist Church and a volunteer in the youth programs at First United Methodist Church. Janie also participated in the VIPs Program at Cleburne ISD. Janie enjoyed gardening, playing bridge and was a voracious reader. Her greatest joy was doting on her grandchildren and attending their school and sporting activities. Janie endured the Great Depression, World War II, a bout with tetanus, the loss of her husband and the destruction of their home by a tornado. These tragedies did not define her. She was defined by the value she placed on family, God, country and friends. She was a member of the First United Methodist Church. Janie was looking forward to being reunited with her parents, Roy and Mimi; her husband, Luther; and her cousins, Ruth Carl and Fred Jennings and Bill Hothan. Janie passed away at home on January 25, 2016. She is survived by her daughter, Janis Rosenthal and husband, Stephen, of Dallas, Texas; her son, Jay and wife, Suzanne, of Cleburne, her grandchildren, Michael Wilson of Austin, Texas, Matthew Wilson of Denton, Texas and Nicholas Wilson of Cleburne. She leaves behind many dear friends and family.